From working a part-time job to being a Lit Center tutor, freshman mentor, student and athlete, junior Gaby Goldman can basically do it all. People may wonder how any individual can manage this many extracurricular activities, but Goldman handles it all with ease. The majority of Goldman’s focus obviously goes toward school, but playing basketball and going to work are not too far behind. “I’m a lit center tutor, a freshman mentor, and I work with special education kids every day at Fairview South Elementary School, along with school work and playing basketball six days a week. It’s really stressful and exhausting, but I somehow manage to make it work. Although it can be hard at times, I don’t ever see myself not doing any of these things because I’m passionate about all of them,” Goldman said. Goldman’s passion and hard work goes back to when she fell in love with the sport she still continues to play and pursue to this very day: basketball. After realizing that basketball was something she was born to do, Goldman continued to improve her skills and has been playing ever since. “My passion started when I used to watch the older kids at Fairview. After that, I worked hard to learn basic skills and practiced as much as I could, whether it be at the gym or after school on the playground,” Goldman said. Many people, such as Goldman’s basketball teammates, also see her as an incredible aspect of their team and someone with a great work ethic. “Gaby is a super hard worker and leader on and off the court. She always makes sure everyone is working hard and giving their best effort, which is a great asset to our team,” junior Lauren Brace said. However, Goldman’s love for the sport isn’t the only thing that pushes her to keep playing. All of the relationships she has formed and responsibility she has gained help her continue to pursue her passion for basketball. Her coaches see Goldman as an extremely hard worker who does all she can to improve herself and the team. 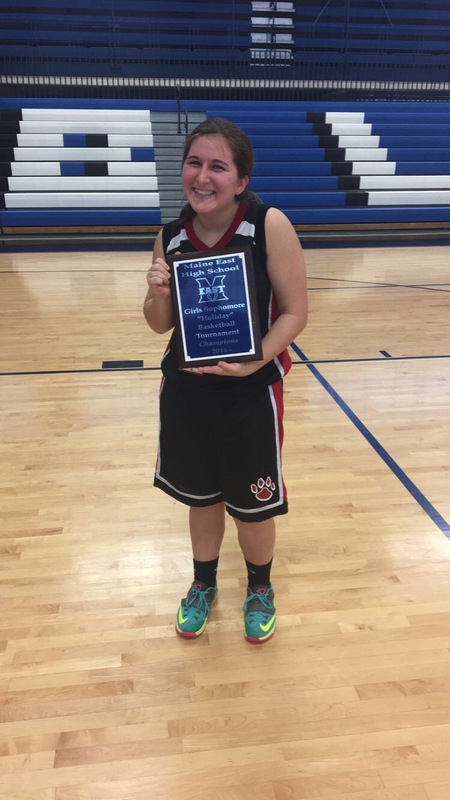 “Gaby has been an outstanding player for the Niles West basketball program. She is a natural leader who always brings energy to the team. She has worked extremely hard to make herself an outstanding three point shooter. She is a team leader on and off for the J.V. team,” basketball coach Garry Gustafson said. Goldman credits basketball for all the benefits it’s brought her on and off the court, and her passion only continues to grow as she gets older. “I am just as in love with basketball now as I was in fourth grade when I first picked up the ball. If it wasn’t for basketball, I wouldn’t enjoy high school as much as I do, and I wouldn’t be as involved as I have been,” Goldman said. Goldman is excited to start off her third year playing for the Niles West Girls basketball program and is enthusiastic to see what this season brings her.